Wide streets send a clear message: We are for cars. Sidewalks seem to exist as an afterthought to the multiple lanes full of rushing, honking, exhaust-belching vehicles. Narrow streets, by contrast, offer a more peaceful, intimate, and pedestrian-friendly atmosphere. 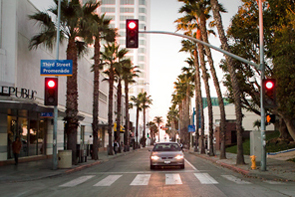 By necessity, cars move more slowly. Proportionally, sidewalks are larger. A narrow street invites people to stroll, gather, and play. Which one would you rather walk on? 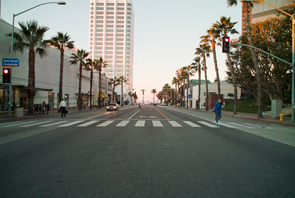 Real streets, unfortunately, cannot be altered in Photoshop. But narrowing a road is not as complex as you might think. 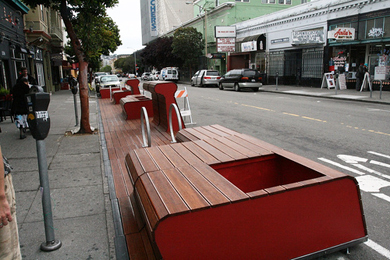 Rebar, a San Francisco art and design collective, has created a bamboo-sheathed module that extends the sidewalk surface into the street and includes benches, planters, bike racks, or tables. Each module is about three feet wide and can be installed by two to four people, with minimal tools. Learn more about Walklets and Rebar. Los Angeles photos courtesy of GOOD and contributed by designer David Yoon, creator of the blog, narrow streets los angeles. Walklet photos courtesy of Rebar Art Collective.